You may have noticed I haven't posted a group read for this month. You may also have noticed I haven't even read the last one yet. Are you guys getting anything out of the group pick, even if you're not reading it with us? Do you mind if I don't read as well? Please let me know in the comments and I will sort it out for next month. Also, I have decided not to give out monthly prizes but to put all your names in for a big prize draw at the end of the year. Not only will this be easier for me but it will mean better prizes for you. Do let me know if you have any ideas for what you'd like to win. There will also be awards for best review, most read, etc. So keep posting your links and if you haven't done so, start linking up your reviews. All your sci-fi reviews for this year will count, so you can go back and add to the previous linkies if you missed out. I'm an unofficial participant (I haven't got a blog and I don't review on Goodreads either), but I've really enjoyed the group picks. I've read 3 of the 4 books. The only one I've skipped was The Year of the Flood because I've read it earlier. I like the group picks because they encourage me to read books I perhaps wouldn't otherwise read. Being able to vote on the book makes me feel more involved. I don't think it's absolutely necessary for you to read the book as well but I do like reading your opinions. Now that I've finally been bold enough to post a comment I'll just say I'm also participating in The Readers Summer Bookclub. Jenni thanks so much for your comment. Sometimes I get the feeling I'm doing stuff and no one's paying attention. If just one person gets some good out of it, it's worthwhile :) I've had other things on my mind the last few weeks so sort of forgot about the challenge but I will make sure there's a poll up for next month. If it wasn't for my book buying ban I would be reading all the group picks. It also doesn't bother me if you don't feel like reading it. Nothing worse than forcing yourself to read something you just aren't in the mood for. Takes the enjoyment of these things away. I do like seeing what has been chosen though. I was trying to think of something to make it easier for you but coming up blank. While I enjoyed the group read last month I have plenty of other SciFi on my to-read list. Nonetheless I would welcome future recommendations. I think it is fine for you not to read the group reads as that is not needed for this challenge and why should you have to when we don't. 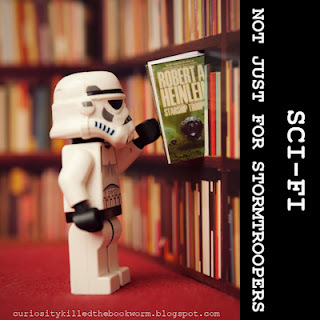 I haven't read any of them yet as I had my own list of Sci-Fi to read for this challenge. But I do look at the list and will most likely come back to it so I like that you have recommendations for us. If my husband hadn't given me a list I would have needed the recommendations. I only put 1 book a month on this challenge but I do read more Sci-fi. Should I just put all my Sci-Fi books up for this challenge? FYI - I've just voted in June's poll as I don't have a book lined up. My read for May is an early epic from the pen of Neal Stephenson. In The Diamond Age he blends the Victorian Age of Dickens with a future Shanghai plus Confucius and a magnificent nano-Mountain of ideas. I did read the book in May but have just posted. :/ Better late than never.